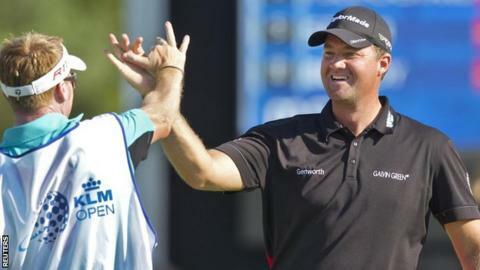 Peter Hanson holed a 35-foot eagle on the 18th to secure a confidence-boosting victory in the KLM Open ahead of the Ryder Cup later this month. The win, which saw him beat overnight leader Pablo Larrazabal by two shots, comes after an emotional week for the Swede. Hanson almost withdrew from the Netherlands event when his young son Tim was admitted to hospital on Friday. But the 34-year-old remained to win his fifth European Tour title. "I'm very happy. I'm still feeling for Tim of course, but he's getting better and better, so I'm very happy about that," said Hanson, who shot a final-round 67 for a 14-under-par total. "It was especially hard yesterday, with having him in the hospital on Friday night. I didn't sleep a lot. "Yesterday was very tough, but I kind of calmed down a little bit yesterday evening when I heard he was over the worst of it." Overnight co-leader Larrazabal carded a level-par 70 to tie for second place with Scotland's Richie Ramsay, who finished one shot ahead of compatriot Scott Jamieson. However, Hanson recovered for a par, while on the same hole Larrazabal made a bogey as they went into the final two holes level. He could only manage a par on the last, handing Hanson the title. Fellow Ryder Cup team-mates Nicolas Colsaerts and Martin Kaymer finished eight and nine under, respectively.